The moment the date was set for our wedding in San Francisco, I knew that my wedding dress was going to be made from pinya (pineapple fiber). It was going to be a summer wedding, so the soft and sheer material would be perfect for the weather. I had no idea back then how the fibers of the pineapple are made into this fabric. All I knew was that the fabric looked elegant and unique– quite extraordinary in a wedding outside of the Philippines. Upon online research, I learned that the cloth is actually woven from leaves of a Spanish Red Pineapple. It is expensive because only a handful of experienced hand weavers have perfected the craft. Depending on how the fabric will be used, pinya can be blended with other fibers like abaca, cotton, and silk. Because I was already living in the US when I was planning the wedding, I had to send my measurements to Manila. 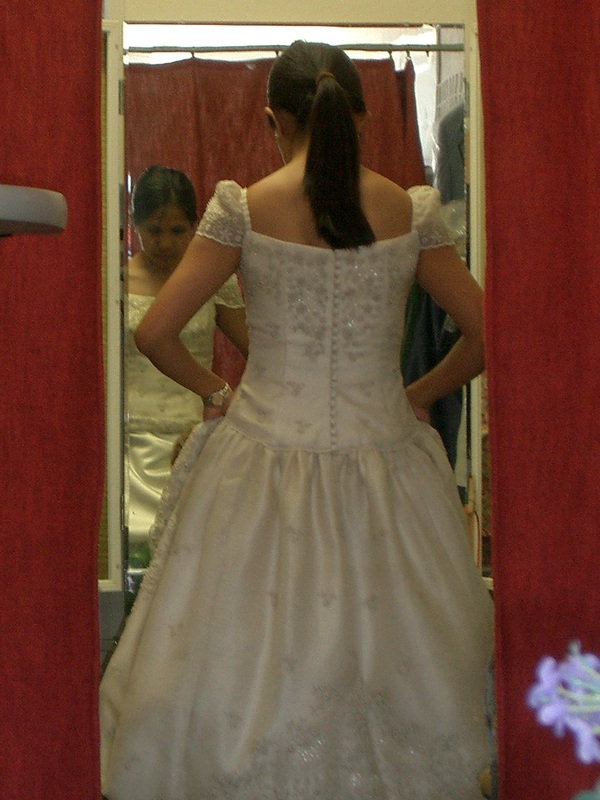 I was adamant that my wedding dress not be turned into a gown; I didn’t want a train nor did I fancy a puffy skirt. So my dress was actually just that, a simple but classic dress made from pinya fiber that was loomed in Aklan, and hand- embroidered in Taal. 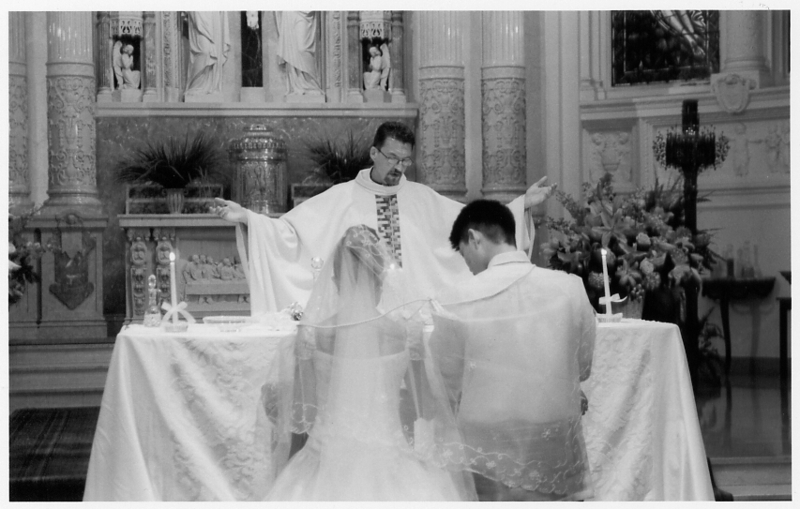 My husband’s Barong Tagalog, the formal attire of Filipino men, had the same embroidery as my wedding dress. There is more to a traditional Filipino wedding than the fabric used. The actual ceremony itself and even the pre-wedding do’s and don’ts deserve their own post. Fitting the wedding dress to make sure that, well—it fits! Posted in Filipino Custom and tagged clothing, keeping culture, pineapple fiber, style, traditional filipino wedding, wedding, wedding gown. Bookmark the permalink. Mom, when I grow up can you choose a wife for me? It was around this time two years ago, when my then 5-year old son made this peculiar request. It was the summer before he turned first grade. Oh, thank you for asking me, but choosing a wife is a decision that you have to make for yourself when you get older. Just like the decision to marry your dad was mine. But mom, what if I don’t make the right choice? He was half whimpering. That’s why as early as now your dad and I are guiding you to be the best man you could possibly be. When the time comes that you are old enough to choose a wife, you would know. You would have had lots of practice making good choices by then. Of course, I will help you, if you want me too. You know that I will always be here when you need help. This surreal conversation was over in less than two minutes, but etched in my mind forever. Who knows what will happen 25 years from now? Filipino moms are known to stick their noses in their children’s affairs. I have certainly had my fair share with my own mom. I have yet to talk to the guy whom my mom berated 20 years ago! Really embarrassing. I am praying that when the time comes for my son, hopefully I would still have at least 25 more years, I would still be as calm as that day in the garage when he asked me for my help. After all, he at 5, gave me permission to choose his wife. Posted in A Mother's Narrative, Filipino Custom, Filipino Parenting and tagged family, keeping culture, motherhood, parenting, traditional filipino wedding. Bookmark the permalink.